Thanks to a Manchester Masjid’s fund raising in the UK, the children now have shoes footballs, table tennis kits, new tracksuits for the boys and the father. The girls have a new abaya each. The mothers are given tapestry and sewing materials to teach the girls the beloved Palestinian artistry of sewing. The family has a hot meal during our visit and is provided with wood for cooking in the coming weeks. Israel’s illegal witholding of essential supplies such as enough gas, oil and the components to maintain the utility works here means that Gaza is being pushed back to the time before electricity existed.When the power is cut, families must cook using gas from canisters. When the gas runs out – and right now, even the smallest gas ration means an eight to ten hour wait – families scavenge for twigs and light fires inside their apartments to try and cook what food they can afford to buy. It is becoming the norm for children to miss meals entirely. In this Beit Hanoun family, I ask the youngest boy of four, what his dream is, what he wants to be; “ I want to eat’ he says. “Somehow. Somehow.” This makes all the family laugh. Next stop, Jaffa Street, Gaza city. The smart home of Mohammed Ajur, 25. He is a handsome young man with the sweet smile of faith (emaan) on his lips. He happily greets his friend who has brought me to meet him and myself and we are seated in the family salon. Mohammed was in his uncle’s home when a rocket hit during what Israel proudly calls operation Cast Lead. He woke up in hospital in Egypt having been in a coma for four days. His family were around him weeping. ‘Habibi, you have lost both your legs’ he is told. His eyes shine with light and he smiles (smiles!) at the memory. ‘What did you say?’ I ask. Although by his contentment I already know the answer. ‘I said “Thanks be to God”’ he replies. Mohammed has since completed his university degree in sports education. He is the kind of man that makes you smile just being around him. On the middle of the table between us is a stunning urn, in copper glaze with rose workings and Arabic lettering across it. I admire it. ‘I made it’ he says shyly. He is also a talented artisan. ‘Do you like this jug?’ He asks me. I do. ‘Take it’ he says. I offer to pay but he refuses to sell it to me. It is a gift. Because I came to see him. One final visit must be made this evening to a man whose livelihood mattered so much to my dear friend Vittorio Arrigoni; a fisherman. This father of six is in his late forties and hasn’t fished for two months. He explains that under the Oslo accord it was agreed that Gaza fisherman could sail up to 25miles from their coastline in order to fish. But Israel never honored this agreement. At first their naval forces forced the fisherman back to just six miles from the coast, then in recent years, to just three miles from the shore. There are no fish in this depth any longer due to over fishing and pollution. So, this fisherman took his boat, within his rights, to six miles and began to fish. The Israelis – as is a daily occurence for fishermen – attacked. At gunpoint he was told to strip naked and jump into the freezing February water where he was made to say for some time. Then still naked and humiliated he was handcuffed and taken to Ashdod for questioning. In the meantime the navy shot his boat so full of holes it is too damaged to repair. The livelihoods of four brothers and their thirty plus dependants – destroyed. Thanks to the same UK Masjid for donating the money to keep these families fed for the next month. After that, what will happen to them? Who knows? As I type these words Israeli fighter jets are buzzing overhead jangling my nerves. They can be flying just for that effect or to launch yet another deadly attack on Gaza. It is 6am. The time when children are having breakfast and getting ready for school. Besides the night, this is the hour most favoured by Israel to inflict emotional terrorism on the population here. Driving through Gaza and seeing the queues of gas and petrol, I mentally titled my writing today as – Gaza’s suffering. But now the title has changed to ‘Gaza’s heroes’. Lauren Booth is a freelance journalist, broadcaster, and human rights activist. Her ground breaking TV series on 'Remember Palestine' and 'Diaspora' have revealed new truths about the Occupation of Palestine. Booth speaks at international conferences on Islam in the 21st Century and women issues. She is the Chair and Co-Founder of Peace Trail and Patron of Cage Prisoner. 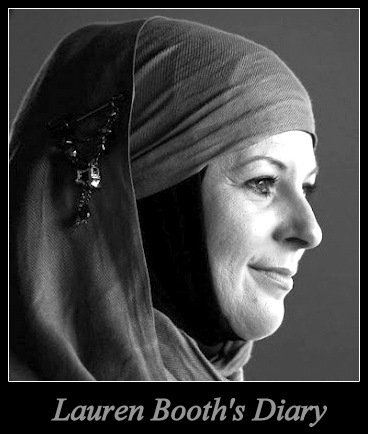 Booth is currently authoring her keenly awaited autobiography "Journey to Islam." hats off to ppl fighting Israeli oppression and excellent work by Lauren. we must support these brothers & sister in whatever capacity we can. I would love to read about more people from gaza, if that is possible. and gaza heroes it should be…. changing the title is the conclusion of these words! Really HEROES since 6 decades.